Surfing in Easter in Cantabria. Easter is approaching and is one of the dates marked in red in the calendar of any surfer to stick to a surfing getaway. In addition it is very good time to surf in Cantabria , the good waves are (almost) assured. And you? Do you feel like surfing at Easter? We are waiting for you at the Cántabra Surf School . With the best teachers and the best courses, with a teaching method tested for more than 27 years to ensure quality teaching and learning. SURF + ACCOMMODATION to get a surf break in Easter. We inform that after a winter of surftrips by different parts of the world the monitors of the school cantabra of surf come back with the loaded batteries and the SCHOOL OF CANFRE SURF QUIKSILVER & ROXY informs that all their surf courses , SurfCamps and activities for This season 2,017. Directed by David “Capi” Garcia since 1991, the school continues to grow and bet on a professional, experienced and quality teaching, on Somo beach, Cantabria, home to the pioneering surf school in Spain where thousands of students have passed through These more than 27 years and have consolidated the school as one of the most prestigious surf schools in Europe. 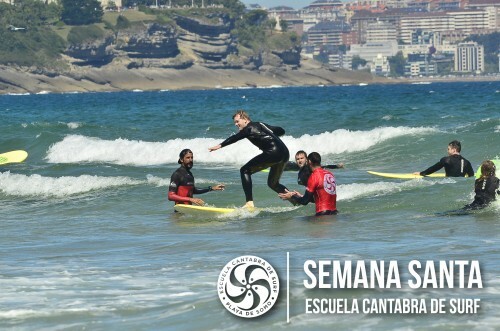 If you are thinking about learning to surf in Cantabria we encourage you to do it in a safe, fun and professional way. Surf courses for all ages and levels. Bodyboard or Stand Up Paddle (SUP) and Skate classes are taught daily. In addition the school has a powerful Surf Camp and other accommodation options such as Surf House and Surf Cabins for its students, as well as a Surf Shop , where they can acquire the latest surfing and surfing techniques. You can follow the daily surfing conditions through your Webcam of the beach of Somo and Loredo. For the youngest, remind you that the squares for Surfing Camps Minors are already open Quiksilver Cantabra Surf School. The girls will have a new edition of Surf Camp Roxy in the first week of July. And last and for all, remember that this summer will be held from 25 to 27 August the Cantabra School Festival of Surf, Skate & Music , on the beach of Somo, Cantabria. But before and throughout the summer we will perform different actions, so we recommend you to be very attentive through our websites and social networks. Health to all, good waves and see you at Easter, or during the year. Good waves & Best Vibes from Somo. ONE LOVE.